Disclaimer: This information is published here in order to provide a general understanding of guardianships, conservatorships, and the alternatives. This information should not be considered as a legal reference. If you have any legal questions dealing with any of these issues, an attorney should be consulted. Who are wards and protected persons? What are the requirements of guardians and conservators after appointment? Who pays for the cost of the guardianship? 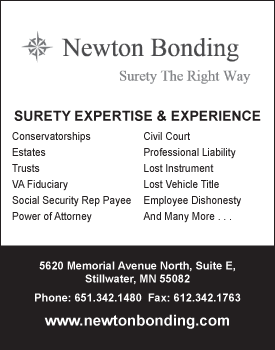 Who pays for the cost of the conservatorship? Who serves as a guardian or conservator? How do I become a professional guardian/conservator? Can MAGiC provide legal advice or case consultation? A guardian is someone who has been given legal authority by a court to make personal decisions for an individual who is incapable of making his or her own decisions. A ward is a person who has a guardian. The court will appoint a guardian when it has been determined that an individual is not capable of making personal decisions in the case of guardianship. The court appoints a guardian when there is a need for personal decisions (medical, health, residential). The guardian acts as an agent of the court. The guardian has the responsibility to make decisions in the best interest of the ward, in consideration of the ward's preferences and needs. A conservator is someone who has been given legal authority by a court to handle the financial affairs of an individual who is unable to manage his or her own finances. A protected person is a person who has a conservator. The court will appoint a conservator when it has been determined that an individual is not able to manage his or her own finances usually due to a medical condition such as a developmental disability, dementia, brain injury or stroke. The court appoints a conservator when there is a need to pay for needed care, to manage money or to recover stolen assets and when there is no less restrictive alternative than a conservatorship. The conservator acts as an agent of the court. The conservator has a fiduciary responsibility to conserve and manage the protected person’s estate and is accountable to the court for the management of the estate. Any person may petition for the appointment of a guardian or conservator.MS 524.5-303. A petition requesting appointment is filed in the probate court of the county of residence of the proposed ward or protected person. The court will appoint an attorney to represent the proposed ward or protected person if neither the proposed ward or protected person or others provide counsel.MS 524.5-304 (b); .524.5-406 (b). A court hearing is required and notice of it must be served at least 14 days before the hearing upon the proposed ward or protected person and by mail upon the spouse, parents, adult children, brothers and sisters, health care agent or proxy pursuant to a health care directive or living will, or if none of the aforementioned are alive or can be located, on the nearest kindred, the administrative head of any hospital, nursing home, or home care agency of which the person is a patient, resident, or client, any adult who has lived with the ward or protected person for more than six months, and a government agency paying or asked to pay benefits to the ward or protected person. MS 524.5-308; 524.5-404. The proposed ward or protected person shall be present at the hearing unless that person waives the right to appear in person or is not able to attend by reason of a medical condition as evidenced by a written statement from a licensed physician. If after the hearing the court finds that a guardian or conservator is needed, and no less restrictive alternative is appropriate, then a court will issue an order. At the hearing, the court may order the conservator of the estate to post a bond before the letters of conservatorship are issued. Letters of guardianship or conservatorship are evidence of the guardian’s or conservator’s authority to act on behalf of the ward or protected person. Within two months of appointment, a conservator of the estate must file with the court an inventory of the protected person’s real and personal property. MS 524.5-419. A court order, after hearing and notice, is required before a conservator of the estate may sell, mortgage, or lease real property of the protected person. MS 524.5-418 A. The guardian must give notice by mail to the ward and interested persons prior to the disposition of the ward’s clothing, furniture, vehicles, or other personal effects. MS 524.5-313 (c) (3). Within 30 days of the anniversary of the appointment date, the conservator of the estate shall file an annual accounting with the court. MS 524.5-420. Every guardian or conservator shall annually serve notice to the ward and protected person of the right to petition for restoration of capacity, discharge of guardian or conservator, or modification of the orders of guardianship or conservatorship. MS 524.5-310 (e); 524.5-409 (e). The guardian shall annually file a report regarding the ward’s personal well-being with the court within 30 days of the anniversary date of the appointment.MS 524.5-308 (d). Court costs, attorneys' fees for both the petitioner and the proposed ward/protected person, and any ongoing guardian fees are all paid from the protected person's estate. Guardians are allowed to charge a fee for their services. When the ward has no money to pay for guardianship services, the county court or social services department may have a policy regarding paying for some of these costs. conserve and the protected person’s finances can be managed using a less restrictive alternative. While MN law provides a process for obtaining guardianship for a child with a developmental disability who is about to turn 18, this is not always necessary. Parents are often advised to seek guardianship in such circumstances, and are often told that they won’t be able to talk to their son or daughter’s medical providers, that they won’t be able to stop their offspring from entering a contract, that the adult child will no longer have access to governmental or educational services, or that they will be unable to be involved in their adult child’s life unless they are appointed legal guardian. It is important to know that while all of the above may be true in some circumstances, in many situations, the reality is that parents and other relatives can remain active and involved, without the expense and hassle of seeking the court appointment of a guardian. Whoever the court determines is in the best interests of the ward or protected person. The factors considered are the current guardian, kinship, and the reasonable preference of the ward or protected person. The court is required to act in the best interest of the incapacitated person when considering who to appoint as guardian or conservator. MS 524.5-309. Guardians and conservators must also submit to a criminal history and maltreatment records background check unless they are a government entity, bank, or a parent of a person with mental retardation. MS 524.5-118 subd. 1. If you are concerned about the actions or decisions of a guardian or conservator, first talk with the guardian/conservator directly about your concerns and work toward a resolution. Most issues are resolved through respectful communication. Sometimes the problem is based on a breakdown of communication or the situation has become too emotion-laden to deal directly with the guardian/conservator. In this instance, a third party mediator may be of assistance. This could be a professional mediator (check the yellow pages of your local telephone phone directory, or go to Related Links on this website) or an informal mediator or other third party. Sometimes issues simply cannot be resolved, and the parties have to agree to disagree. However, in rare circumstances, there may be an irreparable breakdown, such that the guardian/conservator can no longer be effective in helping the ward/protected person. The ward/protected person has the right at any time to contact the county probate court to request a change in guardian/conservator, though this is generally ill advised before attempts to resolve the problem with the existing guardian/conservator. Contact the county probate court with your concerns. The court may re-involve the original court-appointed attorney, send out the court visitor to further investigate, forward the concern to Adult Protection, simply file the complaint and address it later if more issues arise, or take other action, at its discretion. File a complaint about suspected abuse, neglect, or financial exploitation of a vulnerable adult with MN Adult Abuse and Reporting Center (MAARC at 1-844-880-1574) the county's Common Entry Point (CEP) or Adult Protection (to find the CEP in your county, go to Related Links on this website [correct this link too]). Every ward/protected person is considered a vulnerable adult. You do not need to conduct your own investigation of maltreatment. You do need to have a reasonable belief that it is occurring, and if your report meets their criteria, the Adult Protection staff will complete an investigation. Knowingly filing false reports to the Common Entry Point (reports made in retaliation or anger or otherwise in absence of belief of wrongdoing by the guardian/conservator) could result in civil penalties and punitive damages. However, a good faith reporter is immune from civil or criminal liability that may arise as a result of the report. If the matter is criminal or involves theft, you may make a police report, but you do not have to if you have already filed a report with the Common Entry Point, as they should automatically refer it to the police if necessary. You can report to both places if you desire. 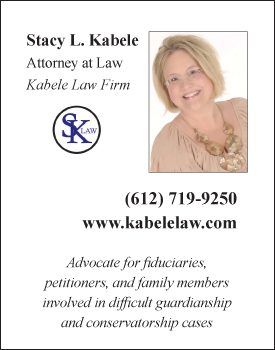 A person is appointed guardian/conservator by the probate court after a court hearing on a petition which alleges that the respondent is an incapacitated person and in need of a guardian and/or that the person is unable to manage their estate, and in need of a conservator. It is the petitioner who nominates the guardian/conservator. The petitioner is someone who becomes aware of the need for such action, usually a family member or professional care provider. If in the court hearing, the court finds that a guardian/conservator is necessary and that the nominated person is the most suitable and best qualified among those willing and able to serve, the court would appoint the nominated guardian/conservator. It is important to note that the majority of guardianship and conservatorship petitions seek the appointment of family members or others known to the respondent. Payment is dependent on a number of circumstances, including whether the guardian/conservator is a professional or a family member; whether the person under guardianship has an estate, and the policies of the county in which the guardianship/conservatorship is established. 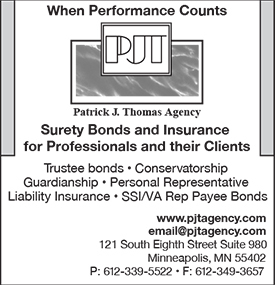 Unless employed by an agency serving in this capacity, professional guardians/conservators are independent contractors. Persons interested in pursuing work as a professional guardian/conservator should recognize that it can take a number of years to find themselves with the size and type of caseload that will allow them to count on this as a reliable source of full or part-time income. Depending on the county in which they work, professional guardians/conservators may be able to charge an hourly rate for their work with some clients; however it is important to remember that not all clients will require more than an hour or two of billable time in a given month, that there is much time in a professional's day that is unbillable, and that when clients reach status of financial indigency, the responsibility to serve continues, even without the former rate of pay. At this time, there are no educational or licensure requirements for guardians/conservators in Minnesota. However, the National Guardianship Association (NGA) does offer a registered guardian (RG) program. 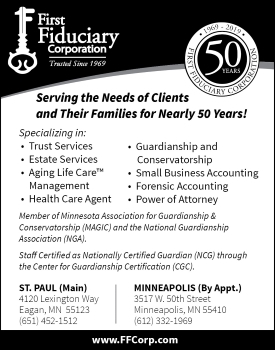 Many find it helpful to seek training through educational opportunities offered through MAGiC and NGA (www.guardianship.org), as well as private study of the laws governing guardianship (MN Statutes 524.5-101 through 524.5-433), and related web sites, such as the state courts website, which includes forms and a guardianship/conservatorship informational manual (www.courts.state.mn.us). Additionally, a person hoping to become a professional guardian/conservator must be known to attorneys who represent petitioners in need of a guardian/conservator, as well as others in the medical, housing, and social services fields who may refer persons for guardianship/conservatorship. No. MAGiC is a membership organization which strives to provide general information to members and the public about guardianship, conservatorship, and less restrictive alternatives to provide a general understanding about these issues through this website. However, we are unable to provide legal or case advice. If you have any legal or practical questions regarding how to manage an existing guardianship/conservatorship, please peruse our website, including FAQ's, resource links, and educational sections and consult with your attorney. Nothing on our website should be considered as legal advice.